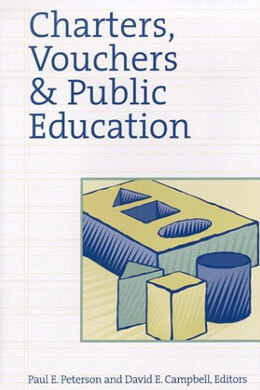 This volume brings together the most current empirical research on two important innovations reshaping American education today-voucher programs and charter schools. Contributors include the foremost analysts in education policy. Of specific significance is cutting-edge research that evaluates the impact of vouchers on academic performance in the New York City, Washington, D.C., and Dayton, Ohio, school systems. The volume also looks beyond the American experience to consider the impact of market-based education as pioneered by New Zealand. Contributors also take stock of the movement's effects on public schools in particular and public opinion at-large. With thorough summaries of the existing research and the legal issues facing school choice, Charters, Vouchers, and Public Education will be key to readers who want to stay current with the burgeoning debates on vouchers and charter schools. Contributors include Terry Moe (Stanford University and the Hoover Institution), Gregg Vanourek (Yale University), Chester E. Finn Jr. (Manhattan Institute and the Fordham Foundation), Bruno V. Manno (Annie E. Casey Foundation), Michael Mintrom and David Plank (Michigan State University), Helen Ladd (Duke University), Edward Fiske (former New York Times columnist), Jay P. Greene (Manhattan Institute), William G. Howell (University of Wisconsin-Madison), Patrick J. Wolf (Georgetown University and the Brookings Institution), Mark Schneider, Paul Teske, Sara Clark, and S. P. Buckley (SUNY-Stony Brook), Robert Maranto (Villanova University), Frederick Hess (University of Virginia), Scott Milliman (James Madison University), Brett Kleitz (University of Houston), Kristin Thalhammer (St. Olaf College), Joseph Viteritti (New York University), Paul Hill (University of Washington and Brookings Institution), and Diane Ravitch (New York University and Brookings Institution).